Not all peafowl have dark brown eyes. Some have dark blue, light blue, or hazel eyes. Almost all peachicks, from what I have seen, will have blue eyes and as they get older their eyes will turn brown. Some peafowl, like whites and pied peafowl, will always have blue eyes. 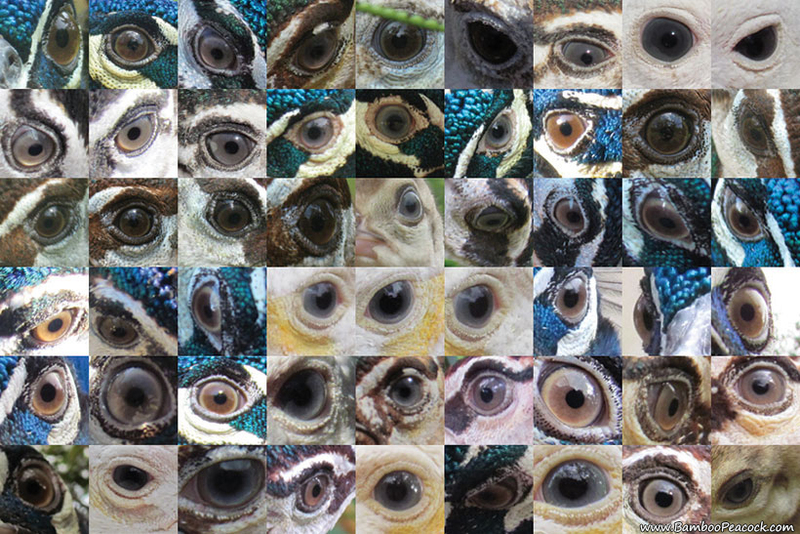 The eye feathers of a peacock can look different depending on different lighting, rain, and of course depending on the variety of peafowl. All but one of these photos are India Blue eye feathers. The one that is not is the white eye feather and that one belongs to an India Blue Pied peacock. Neck feathering can also look different in different lighting. A peacock can have a bright blue neck in the sunlight, and a dark blue neck in the shade. 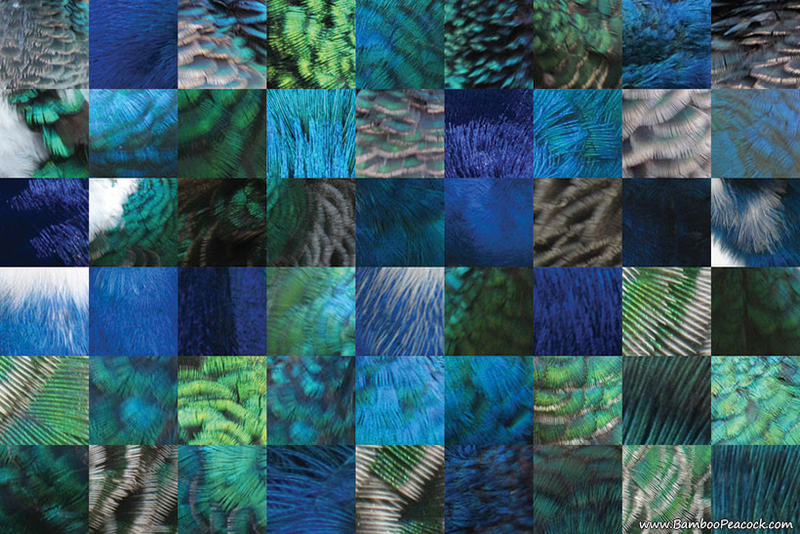 Also these closeups concentrate on the color differences of peacocks and peahens. The green feathers are peahen feathers, and the blue ones are the peacock neck feathers but in some lighting peahen feathers can look a bit more blue. The lower neck feathers of a peahen are lined with a creamy color. Young peacocks will have a greenish blue neck until they are older. Sometimes I have trouble telling two white peahens appart, but I noticed recently that one of them has a few small black spots on her beak. They are like freckles and it goes to show you that even if two birds look alike, they do have differences even if that may be subtle. 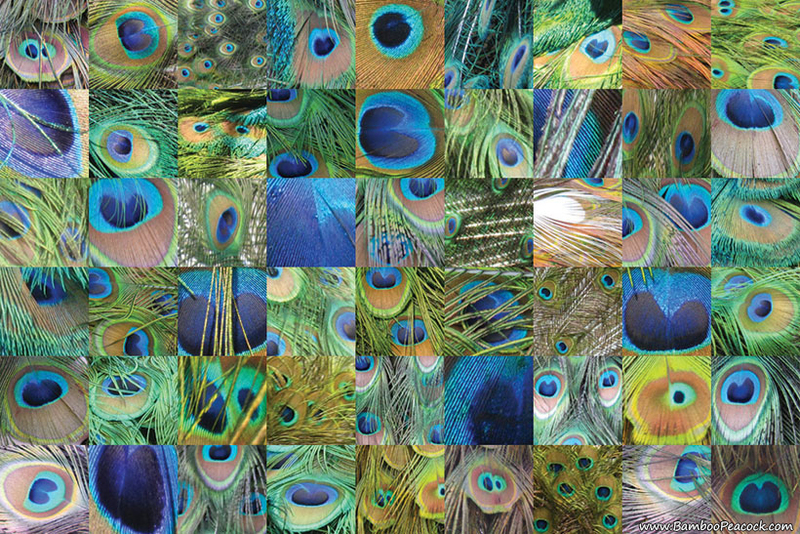 It would be fun to make one of these collages with photos of all the peafowl colors so that you can easily see all the color differences in the different varieties. With over 225 varieties of peafowl, I have hardly shown you all the color differences but it is fun to show how there can be differences in just a few or one variety.